Dozens of flights to and from UK airports have been cancelled by the latest strike by Ryanair staff. An estimated 2,000 Ryanair employees, mainly cabin crew working in Spain, Germany, Belgium, the Netherlands, Portugal and Italy, as well as Dutch and German pilots, are stopping work. They are unhappy about issues from pay to labour contracts. As with several previous stoppages this summer, the industrial action has been coordinated across Europe for Friday – normally the busiest day of the week. In total, around 250 flights have been grounded, affecting 40,000 passengers. Ryanair had cancelled 150 flights earlier in the week, notifying the affected customers and telling other travellers that their departures would go ahead. But on Thursday the airline said pilots in Germany would join the strike, with up to 100 additional flights shelved as a result. Stansted, the airline’s biggest base in Europe, is Britain’s worst-affected airport. Twenty flights, mainly to and from Germany, have been cancelled. At Manchester, links to and from Barcelona, Berlin, Faro and Malaga have been grounded. Other cancellations include Birmingham to Lanzarote and East Midlands to Malaga. Ryanair first recognised trades unions in December 2017, after thousands of flights were cancelled due to a shortage of pilots. Since then, it said “significant progress” had been made in negotiations with trade unions across Europe. Its chief executive, Ryanair’s Michael O’Leary, said: “Progress is being impeded by the interference of competitor airline pilots and cabin crew who are conspiring to call repeated and unnecessary strikes, which are disrupting Ryanair’s customers, and damaging our business for the benefit of their legacy airline employers. Passengers whose departures are cancelled are entitled to replacement flights, accommodation and meals. 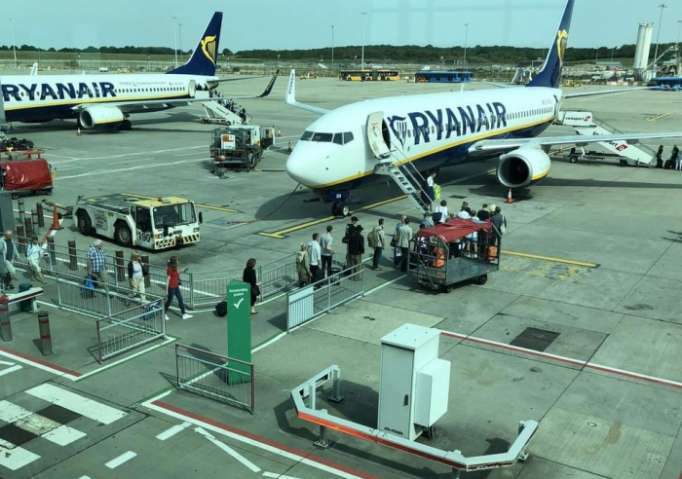 In addition the Civil Aviation Authority has urged Ryanair passengers grounded by strikes to claim €250 (£220) or €400 in compensation under European air passengers’ rights rules. But Ryanair says it will reject any compensation claims for strikes because they were caused by “extraordinary circumstances”.